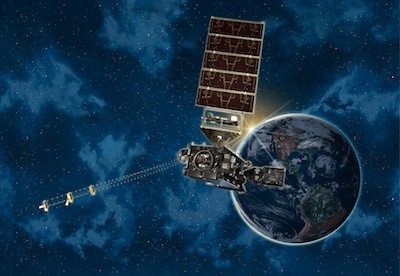 NOAA has ordered two more GOES geostationary weather satellites from Lockheed Martin Corp. for launch in 2019 and 2024, officials said Wednesday. The GOES-T and GOES-U satellites will be nearly identical to the GOES-R and GOES-S satellites now under construction by Lockheed Martin. The satellites will continue GOES weather observations through 2036, taking real-time images and piping data to weather forecasters, news organizations and the public. Meteorologists use the Geostationary Operational Environmental Satellite system in tracking severe storms, hurricanes and other weather systems to help develop short-term forecasts. The National Oceanic and Atmospheric Administration picked up contract options for the two satellites under an existing agreement with Lockheed Martin. The GOES-T option is worth $175.9 million, and the GOES-U option is valued at $139.7 million, according to John Leslie, a NOAA spokesperson. GOES-T's projected launch date is in April 2019. GOES-U's launch will follow in October 2024, Leslie said. Gary Napier, a Lockheed Martin spokesperson, said the satellites will be assembled in the company's facility near Denver. The four GOES-R series spacecraft are based on Lockheed Martin's A2100 satellite platform. The four-satellite series will add new instrumentation to the GOES program, allowing meteorologists to better observe the structure of clouds, measure the rate of precipitation, and estimate the winds around tropical cyclones. The GOES-R satellites series also includes the program's first lightning detector and sensors to monitor solar activity and study space weather. The GOES system observes weather from geostationary orbit 22,300 miles over the equator. One operational satellite covers the Pacific Ocean and the western United States, and another spacecraft is positioned over the Atlantic Ocean to monitor hurricane development and weather over the eastern United States. NOAA keeps a third satellite in standby mode. The GOES-R spacecraft is scheduled to launch from Cape Canaveral, Fla., in October 2015 on a United Launch Alliance Atlas 5 rocket. GOES-S's launch is set for February 2017 on another Atlas 5 rocket. Launch services for GOES-T and GOES-U have not been awarded.